I am not a big fan of packing checklists. They always seem a bit patronising. Toothbrush, toothpaste, two pairs of shorts, two pairs of hot pink lederhosen… it’s not rocket science. Therefore, rather than list every possible item from cotton buds to prayer mats, here are some general bits of advice about what to pack for Peru. For more info about Peru travel preparation, read Things to Do Before Going to Peru. Quick Tip: If you would like to book tours in advance and save your money from overcharging travel agencies while you are in Peru, check out FindLocalTrips.com. This website is a tour comparison with heaps of info and all the different options for taking that trip of a lifetime. You will probably go to the airport fully dressed rather than completely naked. That’s a good start. You don’t really need any more clothes – you can always buy them in Peru. Put these essential items into a backpack. You are now ready to go. You should have quite a lot of free space in your backpack, so you might as well chuck in some more clothes. It will save you the hassle of going shopping in Lima when you arrive, a prospect that only 50 percent of travellers (at most) would find appealing. Will it be hot, cold, wet, dry, calm, windy…? In a word, yes. You are heading to the land of costa, sierra, selva: the coast, the highlands and the jungle. A long distance bus ride can take you through coastal desert fogs, bone chilling altitudes and swathes of sweltering Amazon greenery in less than 18 hours. When it comes to clothing, pack light, but pack with variety. Shoes are worth some consideration before your trip to Peru. Taking two pairs is a good idea. Take some lightweight shoes for day-to-day strolling and a pair of proper walking shoes for treks, trails and off-road trips. Break them in at home to avoid blisters on the road. Finally, pack something vaguely smart and presentable. That may go against the dirty backpacker creed, but it makes sense. Firstly, you may end up hitting some trendy nightspots during your travels. A t-shirt will normally be fine, but you never know when you might want to step it up a gear. Secondly, Peruvian officials judge you with their eyes. If you look reasonably smart (and act politely), border officials, policemen, immigrations officers and other “people of power” will be less likely to give you a hard time. Pack your iPod (MP3 player) and your camera. That’s all you really need. Remember to pack the necessary cables and chargers. You may also need an adapter for recharging directly from Peruvian electrical sockets. For more info, read Electricity and Plugs in Peru. Sleeping bag – not vital, but a lightweight sleeping bag is a good backup option if you have room in your backpack. 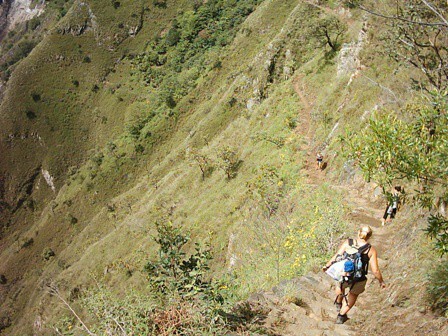 If you have booked a multiday trek (such as the Inca Trail), find out what equipment your tour agency provides. You might need to bring your own sleeping bag. Mosquito net – useful when the mosquitoes are driving you crazy, but not essential. In my three years or so in South America, I think I’ve used my mosquito net only three or four times. A good repellent is often enough. Tent – strapping a tent onto your backpack has a nice adventurous feel to it. However, unless you know you will be camping in Peru, you are unlikely to use it. Campsites are rare in Peru. If you are packing things like sun block, shampoo and mosquito repellent, keep the bottles small. You can buy all of these on the road, so there’s no point overdoing it. It’s better to travel light and stock up when necessary. There are pharmacies all over Peru that stock most common medicines. If you have any specific medical needs, you should obviously pack the appropriate medicines before your trip to Peru. You can buy sanitary towels, condoms etc. in supermarkets, pharmacies and smaller stores all over Peru. Some of the condoms are very weak, so exercise caution. You might want to bring some with you. All of the above is slightly flippant because packing for Peru depends upon so many factors. What is the focus of your trip? For how long are you travelling and in which regions? What is your budget? There is no “one size fits all” approach. We have a lengthy piece on a suggested route through Peru which will, at least, give you some ideas for your trip. Another point to note; Lima Airport is located in Callao, a dangerous area quite far from the main cultural area of Miraflores. Taxis cost around $25usd or else take the Airport Express Lima bus service which runs every 30 minutes with free wifi onboard. If you have any Peru packing questions or suggestions, be they general or specific, post a comment below and I’ll get back to you as soon as possible. I’m finding conflicting information on electrical outlets. Some websites say the North American plug is used, othesr the European. It’s a good idea to bring a universal adaptor that lets you use all possible combinations. Some hotels, hostels etc will use only one type, so it’s very handy if you can easily switch between the two. My friend and I have started planning a three week trek in Peru. And by started, I mean we decided on this yesterday. It will happen some time in the distant future (most likely the end of May in 2012 or 2013), but I just wanted to do some general research at the moment. Ideally, we’d be arriving in Lima and headed south, hitting Nazca, Arequipa, and circling up to Puno and Cuzco, ending back in Lima. (What do you think of this plan? Are there any must-see destinations that we can’t miss? As you can tell, we’re looking at circling the southern half of Peru, so if there are specific places that elicit general excitement there, let me know). We’d like for our budget to be small as possible- no high standards or big souvenir spending for us. How much would you recommend us to bring (both packing and money-wise)? The average daily backpacking budget in Peru can be as low as US$20 (less is possible, but you’ll be limited). $30 a day is a comfortable amount, but bear in mind that this is a daily average – tours, flights and occasional fancy restaurants (and alcohol!) can soon take you above this. On a three-week trip, hitting most of the hotspots, you should probably see $30 dollars as a low estimate (you’ll want to make the most of your time in Peru!). As for packing, try to pack as light as possible, just because it’s annoying lugging around a cumbersome backpack. You’ll be travelling through a variety of climate types and altitudes, so you should bring a mix of lightweight and warm clothing. That sounds like a good plan. Myself and a friend will be going essentially the same route in July though we’ll there for a month. Two things that I wouldn’t miss: hang gliding in Lima and of course, Machu Picchu! 2 I want to do a trek in Cusco, whats your recommendations ? also I really want to do Colca Canyon ? 3 Im basing myself in Cusco and my stay is paid for. But I want to spend time traveling. Im a virgin at all off this. What is the cost for cheap cheap rooms and food. 4 How much should I take for the six weeks. was thinking 1000pounds around 1700 dollars. When I get to Cusco I will do little bar eat and get use to living there for a week. so really its 5weeks spending money I need. If you want to see more scenery, taking the bus is the best option. But bear in mind that a portion of the Lima-Cusco bus journey will be during the night, so you won’t really see anything then. Still, it’s more interesting than flying (if you have the stamina for a long bus ride). If you’re passing through Arequipa, the Colca Canyon trek is definitely worth doing. The Inca Trail and alternative treks to Machu Picchu are all good options (depending upon your budget and how far you want to walk). There are plenty of other non-Machu Picchu treks to choose from, such as treks to Choquequirau and around the Ausangate circuit. Apart from the classic Inca Trail, you can arrange treks when you get to Cusco, giving you time to ask around and find out which is good for you. The cheapest dorm rooms normally start at around S/.15 (US$5.50) per night. The cheapest food options (set lunch menus) cost between S/.3 to S/.7 — pretty cheap for the amount of food served. As a budget traveler, £1,000 is reasonable for six weeks, especially if you stick to hostels (dorm rooms) and eat in “normal” restaurants (avoid the expensive touristy restaurants). Just keep your beer-buying under control! Great information! We are traveling with our 1.5 year old son and staying in low budget hostels. We will mostly be in Lima, Sacred Valley, and Lake Titicaca end of October. Will we need a mosquito net for sleeping in these hostels? One of my biggest concerns is Mosquito bites, since I had TWO friends get Dengue Fever while I was traveling Thailand and I am traveling with an infant who for the most part can’t be vaccinated or take medications…thanks! Sorry about the late response, I’ve been traveling. You won’t need a mosquito net for any of those destinations, so no problems there. Cheers! I’m travelling to Peru with a school group in July and was wondering about vaccinations. We are travelling to Lima, Trujillo, Huanchaco and Cusco and I am not sure as to whether I should get a rabies jab. Also, will it be cold? I’ve been told around !9 celcius but to pack jeans, which I wouldn’t wear in the UK at this temperature. Hi Mary. Unless you’ll be handling or working with animals, you don’t need a rabies jab. As for the weather, you might find it cold in Cusco, especially at night. It’s definitely worth packing jeans, just in case (or don’t take any and just buy some in Cusco if it gets too cold). Have a good trip! Tony. Hey there. I’m doing a 2 week trek with my cousin next September (2017). We’re pretty much going from Lima to Cusco and back with a few towns along the way – Ollantayambo, Saint Teresa, Hidoelectrica, Aguas Calients, Chincero, etc. My main question is gear. Specifically, back pack and proper clothing. I know I’m going to need some warmer clothes, and will probably buy some sweaters, hats and gloves when we hit Lima. But what do I pack it all in??! We are staying in hostels and doing a home stay, so I will pretty much need to be prepared to bring everything (and carry it) on every leg of our journey. Do you have recommendations or thoughts on a good back pack? Something that can carry my gear and water? Your thoughts are greatly appreciated! I travel fairly light and find that a 65 liter backpack has always been a good size for me (maybe with an additional daypack) for two weeks or a month or more. Any of the backpacks featured in the link above would do for me. But it does depend on how much clothing you want to bring, and how many souvenirs etc you want to take home. Go have a look at some backpacks in a store and think about whether 65 liters is enough — you might want to bump it up to as much as 85 liters. As for carrying water, you can but a bottle that clips on to your pack. And don’t forget to buy some good lightweight trekking shoes, if you don’t own some already — one of the best investments you’ll make. Hope that helps a little. Feel free to ask more, either here or contacting me directly from the contact page. Cheers, Tony.